I played around with ingredients for a weekend and got a homemade hot sauce to taste EXACTLY like Cholula. Its so close I am having trouble telling the difference by taste, they only look slightly different. I’m tired of the trial and error having got it nearly identical, so I’m hoping someone else will pick this up and point out any improvements that can be made and create a recipe with solidly measured ingredients. * Xanthan gum is optional but as I found, not necessary. Maybe I added enough carrots to starch it up. Who knows? *This makes a little bit more sauce than would fit into a regular size Cholula bottle. Some of the spices may not be necessary. So please let me know if you think anything should be removed or added. The reason so many ingredients don’t have specific measurements is because I really just added them on the fly and kept comparing the taste to real Cholula. Get really healthy-looking dried peppers. I got some of the local Colorado ones which were not a very dark red and they were terrible. Then I got the Arbol peppers from Walmart with the stems still attached and it made a world of difference. The main hurdle was figuring out the spices. According to the FDA regulations, any ingredient used as a spice which can also be classified as a food must be declared as a food. Garlic and Onion were specifically used as examples for this rule. So I initially thought that Garlic and Onion could not be in it, since they were not listed. However, after researching, I found an article which talked about the process at the Cholula factory. It said that the Chilis were ground into a paste, then “spiced” and then added to an elixir which consisted mainly of “Vinegar and dehydrated Carrot powder.” I thought this was very strange since “carrot” was not anywhere in the ingredients. So, I’m guessing that there is either some loophole for imported products, a confidential deal made between Cholula and the FDA, or the FDA just doesn’t know the are food items being listed as “spices” on Cholula’s labels and can’t conduct an inspection of the production line since its outside of their jurisdiction. After realizing all of this, I trusted my taste buds that Garlic was likely present in real Cholula and possibly onion as well. I didn’t want to order dehydrated carrot powder, so I put some carrot slices in kosher salt to draw out some moisture and then put the salted carrot slices in the blender with everything else. You need to rehydrate the peppers after removing the stems and seeds. Bring some water to boil and then simmer them for about 20 minutes or until they are soft. Using more boiling water with some vinegar may help to dilute the capsaicin and reduce the heat which is helpful because the chilis in Cholula taste like they are much more concentrated than in other sauces, so you will still get quite a bit of heat after doing this, about the same as real Cholula. Next, strain the peppers and add them to the blender with the carrot slices. Fill with good drinking water just enough to mostly cover the pile of peppers. Then puree them. Add small doses of vinegar and salt until the base for the sauce tastes right. Next add the spices in small doses while comparing the taste to real Cholula. The paprika and red pepper both help fill out the flavor and give the sauce a redder appearance. I added a very small amount of Mexican oregano which isn’t necessary and probably didn’t change the taste. Blend this well, keep tasting and add more vinegar and salt if needed. It’s extremely easy to water this sauce down too much, which can intensify the heat to a point while diluting the flavor of the chilis. I learned this after a few failed attempts. After bottling mine and tasting it with a less burning tongue, I noticed that regular Cholula had slightly more vinegar than mine. Fixing this may thin the sauce out enough to require a thickener, but its not likely. The Arbol and Pequin peppers really overpower anything that is slightly bland, like carrots, so adding more of them as a thickener may be a good idea if you don’t like the slimy nature of xanthan gum. The flavor will get better after the sauce ages for a week or two. 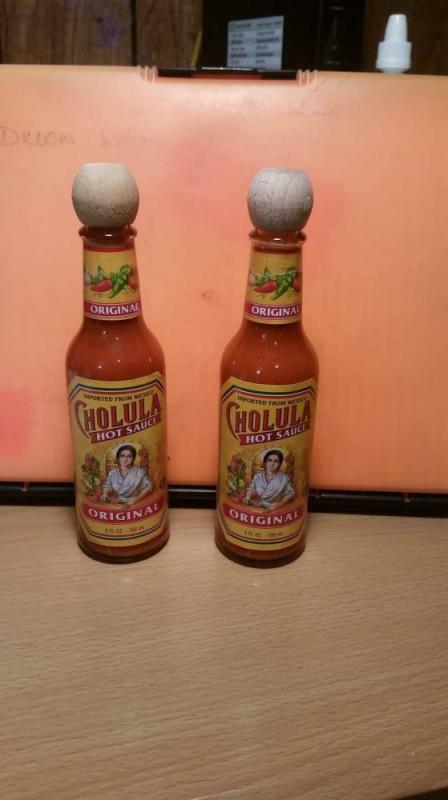 For an Appearance comparison, I took a photo of my sauce and Real Cholula next to eachother, both in Cholula bottles. Mine uses less dehydrated ingredients, and thus has less white specs floating in it. Thank you, that's an excellent post! Great write up. Cholula is the hot sauce that got me interested in making my own sauces.